Internet and social media platforms create an amazing combo that takes care of your virtual socialization. You sure want to grab this brilliant opportunity provided by the technological evolution and make some new friends online. In this connection, WebSmyle deserves a special mention. It has been creating a lot of buzz lately for its exciting service features. Apart from supporting Online friends chat, WebSmyle brings before you mobile recharge and online payment of bill facilities. However, the lack of tangibility often makes one ponder if online friendships are worth it. Should this be your case, then read our blog to burst your confusion. The following section tells you why your online friends are so special. 1. You get to know people from diverse cultures- Social media sites allow you to forge connections with people from different backgrounds and different countries. Not only do these bonds expand your friends’ circle but also broaden your social outlook. You develop respect and compassion for each other. And guess what? Your online friends will enlighten you on amazing cuisines, enriching literature and various other exciting stuff that their respective cultures take pride in. 2. You can choose your friends- Well, your real life might not always allow you to pick and choose your friends. However, with the vast expense of social media on your gadget screen, you are empowered to select friends as per your liking. You can simply go through profiles available on social media channels and select people who you find interesting. With a simple hit on the button, your friendship request is sent to your prospective friend. Is it not super easy? 3. You always have a friend to talk to- Online friendships remain unbothered by time and location. 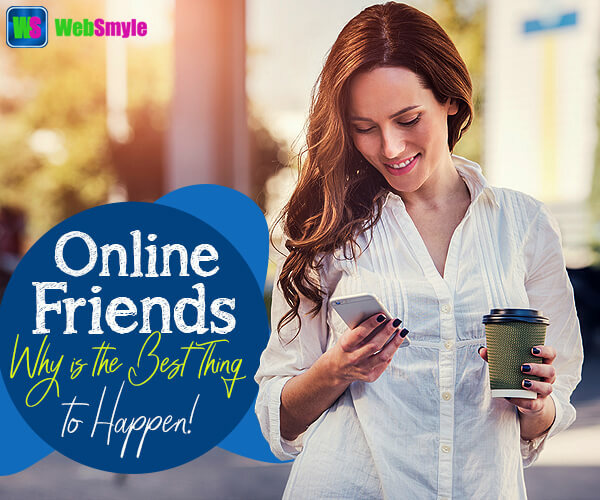 It does not matter if you are traveling or running an errand, you can always stay connected with your online friends on WebSmyle. On top of that, another perk of having internet friends is that you can chat with your foreign friends even at odd hours. This is because different countries fall under differential time zones. Needless to say, online chat with friends never makes you feel alone. 4. You will never run out of discussion topics- Since you bond with your online friends over common interests, you are less likely to run out of discussion topics. Making new friends can really be a boon for you since you get the opportunity to know likes and dislikes of them. Furthermore, hots topics trending on the internet always provide you with materials for discussion and debate. 5. You become less self-conscious- For hanging out with your real life friends, you might have to get all decked up for a girls’ or boys’ day out. However, when it comes to your online friends, things are a lot simpler. You can sit in your bedroom wearing the most comfortable attire and still chat with internet friends. It makes you less self-conscious and your fear of being judged almost vanishes. Conclusion- Real life friends are no doubt precious. However, there is no harm in giving online friendships a try. WebSmyle lets you Chat with new friends on their platform. Undoubtedly, internet friends are always there to have your back at any hour.